COLUMBUS, Miss. -- Ten-plus years is a drop in the ocean as far as Ghanshyam Heda is concerned. That’s the amount of time Heda, a professor of biology, has worked in Mississippi University for Women’s Department of Sciences and Mathematics to lead student research to seek a better treatment for cystic fibrosis patients. It’s a path Heda, who has a doctorate in genetics, started on when he worked at The University of Tennessee Health Sciences Center at Memphis, where he still holds a joint appointment as the professor of medicine. Since arriving at The W in 2008, Heda’s research has slowed in part because he is teaching a full load of classes, but his passion for finding ways to treat cystic fibrosis hasn’t waned. In fact, he continues to find ways to identify and to educate future scientists throughout the world. 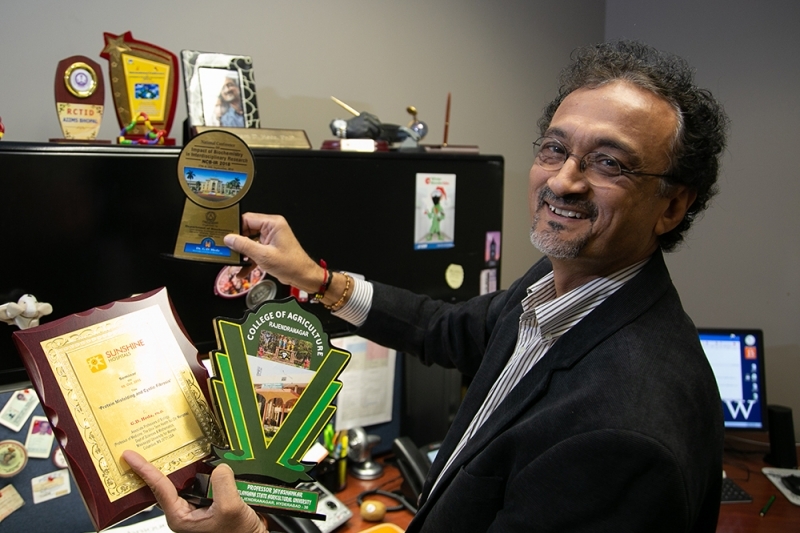 Heda’s latest inspiration happened from July 12, 2018, to Jan. 8, 2019, when he went to India and to Sri Lanka after receiving a Fulbright award to continue researching proteins that interact with the cystic fibrosis causing protein and also play a role in epidemic cholera. Cystic fibrosis is a common hereditary disease that causes mucus buildup in the lungs and digestive tract. It affects about 30,000 children and adults in the United States (70,000 worldwide), according to the Cystic Fibrosis Foundation. In April 2018, Heda received the Fulbright award, which allowed him to be hosted by University of Hyderabad, a large research-intensive university in the city of Hyderabad in south-central India. Heda also spent time in Sri Lanka. On the trip, Heda taught, did research and lectured. In all, he did 13 lectures, including two key note speeches. The Fulbright award gave Heda the opportunity to teach a course on physiology and protein biochemistry to 34 graduate and master’s degree students. Heda also assisted two local colleges in setting up undergraduate research programs. Heda said he takes immense satisfaction in helping to launch the careers of students. He said the chance to do it in other countries was a bonus. “It was laying the groundwork for them and helping to show them what to do and how to get involved,” Heda said. Heda smiled as he recounted one of the students he met on the trip sent him on LinkedIn, a social networking platform. He said the student contacted him and told him he already is missed in India. Heda isn’t sure if he will be able to go back to India or Sri Lanka later this year. Heda also isn’t sure if he will have to put his research on hold. After receiving a grant for cystic fibrosis research from the Mississippi IDeA Network of Biomedical Research Excellence for eight consecutive years, Heda said he doesn’t have a grant for this year. He said is currently putting together a grant application but that process could take up to a year. In the meantime, Heda said he plans to publish his research and to continue to try different things until they work. Heda said that mind-set is needed when battling a disease that 40 years ago offered little hope for children. Today, children who have cystic fibrosis now can live to 40 years of age and older. He hopes to take some of the things he worked on in India as a result of the Fulbright award and apply them to his research to help those with cystic fibrosis lead better lives. The Fulbright Program aims to increase mutual understanding between the people of the United States and the people of other countries. It is the flagship international educational exchange program sponsored by the U.S. government. Fulbright alumni have become heads of state, judges, ambassadors, cabinet ministers and CEOs, as well as leading journalists, artists, scientists and teachers. They include 59 Nobel Laureates, 82 Pulitzer Prize winners, 71 MacArthur Fellows, 16 Presidential Medal of Freedom recipients and thousands of leaders across the private, public and non-profit sectors. The Fulbright Program was established in 1946 by Sen. J. William Fulbright of Arkansas. Sponsored by the U.S. Department of State’s Bureau of Educational and Cultural Affairs, the program awards approximately 8,000 grants annually. Since its inception, more than 380,000 "Fulbrighters" have participated in the program.